I need to put my energies towards other things in my life right now so I am taking a break. I will be back! When a girl is asked out by her sweetheart on Valentine’s Day, she usually says yes – but a trip to the dentist at 8.30am on Saturday morning to sit in the waiting room and listen to the sounds of his teeth being drilled was not that tempting. I declined. Happily, E’s teeth were feeling much better by evening so we could enjoy a nice Valentine’s dinner. Last year in late February I had purchased a set of heart shaped cookie cutters. So this year when I decided to make polenta on Valentine’s Day, I realised I had the opportunity to use them. The recipe I had in mind is pictured in Vikki Leng’s A Vegetarian Feast and often caught my eye when I browse through that cookbook. The antipasto polenta was full of chunks of olive and sundried tomato and spring onion that made tricky work of cutting out shapes. But it was fun to do. More successful was my experiment with cooking polenta in the microwave. I have wanted to be able to do this ever since making Polenta and Quinoa Sticks mid last year. I found a recipe on the net but ended up changing it a little. I added more water and cooked it a bit longer but was pleased that it was easy to see when it was ready. I’ve always hated the hard work of stirring polenta which is like battling an angry belching volcano of lava. Now I have made my first foray into polenta in the microwave there will be no looking back. 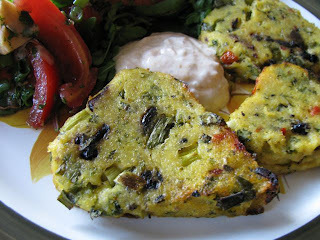 Both the Vikki Leng recipe and the microwave recipe suggested serving the polenta warm but I have always liked Vikki’s picture of it grilled and a little crispy around the edges. I cooked it in the oven and it was nice but I think I preferred it the next night when I reheated it under the grill (broiler). The onion and garlic in the mixture was a bit harsh uncooked so it I was to serve it soft I would reduce these. But if you don’t have time to let it set and cook, then this is a good alternative. I wanted to keep dinner simple and served the polenta with a marinated tomato salad, which was quite vinegary, and a sauce of apricot chutney and yoghurt. I decided not to make a dessert because we had enough good sweet treats in the house: fruit salad, icy poles, choc chip cookies, and cookies & cream ice-cream. I had fruit salad and E chose the one dessert I had bought at the supermarket rather than made myself! He did redeem himself by telling me that it was the nicest polenta he had ever had because he really liked it with all the flavourings. 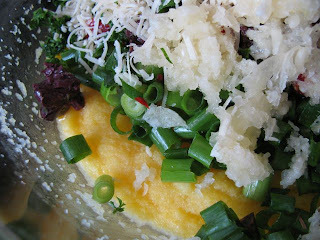 Place all polenta ingredients in a large microwave safe bowl. Stir and cover. Microwave on High for 10 minutes, stirring every 2 minutes, or until mixture has thickened to a porridge-like consistency. Once the polenta is firm, use cookie cutters or a sharp knife to cut into shapes – I did hearts, Vikki did triangles. You could also do rectangles or circles. Place on an oven tray and spray with oil. Bake at 200 C for about 40 minutes or til crisp, turning over halfway through baking. Or cook under the grill or on a frypan. To make dressing, whisk all ingredients in a small bowl OR place in a jar and screw lid on tightly and shake to combine. 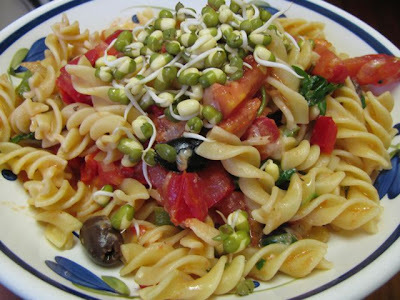 Place tomatoes, artichokes, spring onion and parsley in a small salad bowl. Pour dressing over and toss to combine. Set aside for 10-15 minutes. To serve, place spinach and rocket leaves on a plate. Arrange tomato mixture on top of this and drizzle with any additional dressing. Good bread, lots of vegies and time to make a salad sandwich! Luxury! Just what I needed on a warm summer’s day! I’d been to Fatto a Mano (Gertrude Street, Fitzroy) and bought a loaf of their fine pumpkin and cumin bread. I’d had a yen to buy fresh beetroot at the supermarket – which always takes me back to my days making salad rolls as a volunteer at the university food co-op. This salad sandwich is different to my standard one with cheese. I meant to include cheese but forgot and it really didn’t matter. 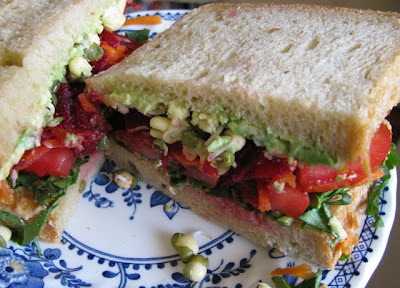 This sandwich had plenty of taste and texture - peanut butter, shredded baby spinach, sliced tomato, grated carrot, grated beetroot, mung bean sprouts, freshly ground black pepper and avocado. I want to recommend you try this fantastic combination, but the joy of salad sandwiches is fossicking in the crisper of the fridge and letting inspiration lead you. So instead I wish you the weather and whim to make salad sandwiches! During the hot weather we had over the last few weeks, I had a yen to make icy poles (popsicles to Americans and iced lollies to Brits). It took me a while to find some moulds but finally I asked in a local homewares shop and found I had walked straight past the display at the entrance. I hardly have icy poles these days but the hot weather has made me think they would be welome. We used to have them more when I was young. My mum made them sometimes but I remember them more when we were at the pool on hot summer days and kids would have brightly coloured rings around their mouth from the dye in the commercial icy poles. Those were the days when we didn’t worry about too much sugar and artificial colouring! On the same day that I bought my new moulds I found some cheap fruit in a local greengrocers. 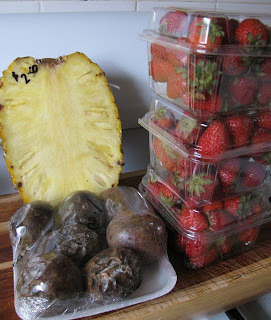 I got 3 punnets of strawberries, 7 passionfruit and half a pineapple for $5.50. What a bargain! It wasn’t the freshest of fruit but kept a few days in the fridge and the strawberries were small, sweet ones unlike some of those tasteless, large ones they sell in the supermarket. 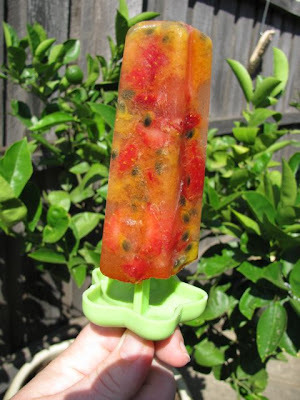 I had my eyes on an icy pole recipe from The Australian Women’s Weekly Vegetarian Cooking. It said it made 12 icy poles but it barely made 6 for me. I presume the moulds are much bigger than they used to be. I would have topped mine up a little but wasn’t sure how much room I needed for the mixture to expand in the freezer. These are nice and healthy snacks that I have been enjoying even though it is not unbearably hot at the moment. The rest of the fruit went into a fruit salad and a smoothie. 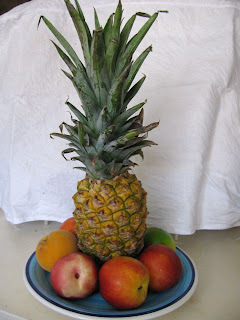 The fruit salad is similar to this one. I have listed my ingredients used in the smoothie below because I have enjoyed it so much, although I didn’t think to take a photo. It was delicious but be warned it is quite seedy and tart if you are not into that sort of thing. 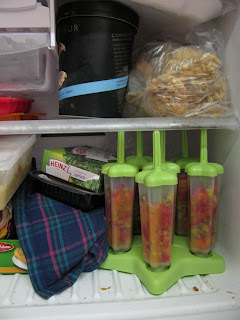 Actually, it has occurred to me that a smoothie in my icy pole moulds might make a good frozen treat. My mum says she used to put cordial in the icy poles she made for us as kids. Enthused by my first attempt at icy poles, I have been interested in some of the interesting ideas around the web. If you don’t have your own moulds then La Tartine Gourmande suggests freezing the liquid in shot glasses with icy pole sticks in them or Ice Cream Ireland suggests freezing a banana with an icy pole stick in a in it (dipping in chocolate is optional but sounds delicious). I am sending my icy poles to one of my favourite blog events, Heart of the Matter which is hosted by Michelle of The Accidental Scientist this month. The event is two years old and theme is finger food. I am never quite sure exactly what finger food is – I think it is snacks that can be eaten casually and often in company. And these icy poles definitely are the sort of heart-healthy food that this event encourages. I was pleased to offer one of these to my mum during her visit yesterday (after all she has made a few of these for me in her time) but they would also make great party food. The box which my moulds came in shows that if you are entertaining, you can get a bucket of ice and plunge the icy poles into the ice! (On a practical note, you might also need a container of hot water to dunk the icy poles in to remove from the moulds.) Like all good finger food, these can be a little messy but fun! * I don’t have a fancy juicer but just pressed my wooden citrus juicing stick into a chunk of pineapple above a mixing bowl. Mix all ingredients in a bowl and spoon into icy pole moulds. Set in freezer overnight. To remove from mould, run under hot water. Serve frozen. Recently I bought a packet of paneer at supermarket on a whim. I don’t recall cooking with it before so I was curious, even though I have eaten it elsewhere. After the packet sat in the fridge a while, I turned to what was the most obvious dish to try – palak paneer or spinach and cheese curry. I found a recipe on the BBC website which didn’t seem too daunting. I used a 250g packet of frozen chopped spinach rather than washing, blanching, cooling and finely chopping 750g of spinach. In retrospect I wondered if I needed more spinach and if it should have been chopped a wee bit finer. I also made a few small changes to the spices. I found the taste of the paneer surprising. I thought I had read it was interchangeable with halloumi and therefore I had expected it to be quite salty. But it was comparatively bland, although the texture was similarly quite hard. 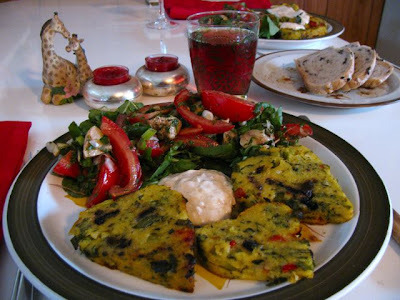 I’d like to try the palak paneer again and to try the paneer in other dishes too. The end result was very spicy. In fact, it gave me a good laugh that E added Tabasco sauce to the curry because he thought it looked like it wasn’t spicy enough. I regularly tell him to taste before he adds Tabasco but he wont be told. He said his was very very spicy. E liked the palak paneer but thought it had a little too much spinach. I think it is really a side dish rather than a main meal, even with rice. On the first night I served it with vegie sausages and the second night I served it with a vegie burger and some aloo jeera (potato with cumin). Originally I had planned to serve it with the dal makhani that I had made earlier in the week but didn’t get organised enough. Maybe another time as I think these dishes would complement each other nicely. After dinner we watched a DVD of As it is in Heaven which my dad had bought us because he loved the film so much. It is the story of a big-city conductor re-discovering life in a small town in Sweden. It is full of joie de vivre and interesting character sketches with an ending that is both heartbreaking and heart lifting! If you haven’t seen it I highly recommend it. Heat the oil in a large saucepan. Add the cumin and fry for about 30 seconds, until fragrant, then add the onion and fry over a low heat for about six minutes, until soft. Add the ginger, garlic and chillies and cook for a further minute. Add the ground coriander and salt to taste. Cook for another 30 seconds then add the spinach and a splash of water if necessary. The mixture should be loose but not watery. Bring to a boil and simmer for three minutes. Add the paneer cubes, garam masala and cream. Stir and cook for a few minutes or until the spinach is creamy. Stir in the lemon juice and check seasoning. Serve with rice or naan bread. When seeking out new Indian dishes to inspire me I have seen many versions of Dal Makhani (aka maa ki dal, maa di dal or kaali dal). I love dal and the pictures I have seen of this intense rich Punjabi version of the spiced lentil stew have beckoned me. Most recently I saw a version on Dhivya’s Culinary Bazaar that I decided to try. I found I had to make a few changes to suit my ingredients and preferences. Dhivya soaked and cooked 1 cup of whole black lentils (whole black urad dal), but I used a tin of brown lentils. I did use dried kidney beans because I had some left in the pantry. I made other minor adjustments. The main change I would make next time is to reduce the cardamom because it seemed a much stronger flavour than the other spices, so I think half a teaspoon next time. I was pleased when the recipe called for a bay leaf that I could duck out to the garden and pick a fresh one. It is a joy having a stock of herbs by the back door but it has been a bit of work tending them in the hot weather. 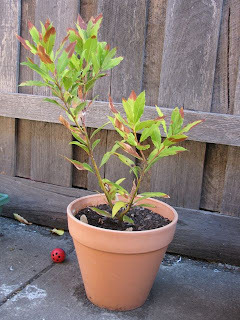 I have included a photo of my little bay plant here to show you how sunburnt it has been in the recent heat. I also chose to use a fresh green chilli rather than chilli paste or cayenne pepper which I sometimes use. I particularly dislike chopping chillis and usually wear rubber gloves to avoid having them all over my hands. I didn’t when I started chopping this chilli and managed to wipe some of the chilli on my cheek and got a red burning mark there for my troubles. So I was interested to see in one of the early scenes in SlumDog Millionaire that not only do others wear rubber gloves to handle chillis but also just how painfully chillis can burn the skin in the case of direct contact. Dhivya served her dal makhani with roti which seems quite traditional according to the Wikipedia entry. I also have found versions of dal makhani written up by Lisa, Meeta, and Jai and Bee if you are interested in seeing how others approach it. I served it with brown rice and some sticks of raw carrot and cucumber. It was a bit intense without a few vegtables on the side. I had good intentions of making a vegetable side dish (Palak Paneer) but ran out of energy. Nevertheless, it was well received. It was creamy and rich with lots of interesting spices. The cream helped reduce some of the bite so it wasn’t too hot for me. E loved it and was delighted to hear that we had leftovers for the next night. 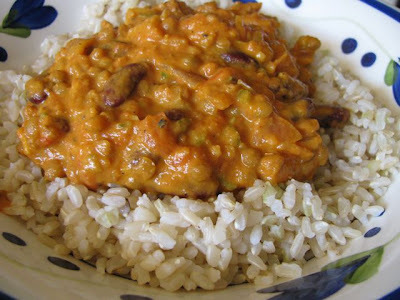 This legume-rich dish is just right for My Legume Love Affair so I am sending this to Susan at the Well Seasoned Cook who founded the event and is hosting the 'eighth helping' this month. In a large saucepan, melt butter, add cumin seeds for a couple of seconds and then add onion, cloves, cinnamon, turmeric, coriander, ginger, garlic, and chilli. Sauté around 5-10 minutes til onion is soft and spices smelling aromatic. Stir frequently to stop the mixture sticking. Add the diced tomatoes, lentils, kidney beans, bay leaf and water. Add salt to taste (I merely added a pinch). Bring to the boil. Reduce heat, cover and simmer for15-20 minutes. Stir occasionally to prevent the mixture catching on the bottom of the saucepan. Add the fenugreek leaves (if using) and the cardamom powder, stir and then add the cream. Gently simmer uncovered for 5 minutes. Remove bay leaf. Garnish with fresh coriander if desired. Serve hot with rice, naan and/or roti. It is the 100th Presto Pasta Night this week. 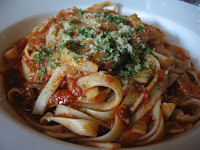 Ruth of Once Upon a Feast has put in a mammoth effort to keep this blog event going for so long with weekly round-ups of fascinating pasta dishes which have re-enthused me about pasta. I wanted to send in some pasta for the celebration week but there hasn’t been a lot of interesting cooking here lately. In this spirit, I thought I would send in my latest pasta project which is not fancy but is easy and tasty. My usual lazy pasta is a jar of pasta sauce and some broccoli tossed through cooked pasta. 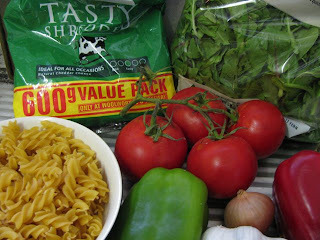 But I made some great pasta last year by throwing in vegies and cheese. Foolishly, I didn’t blog it because it seemed just too lazy. Now I can’t remember what I did and am seeking to recreate it. The place that seemed best for inspiration is Alison Holst’s Meals without Meat which has a recipe for Painless Pasta that I have loved for years. It is such a delightful name, that I have used it here. Unlike most of my dishes I blog, this one is frighteningly easy – 15-20 minutes preparation. I have tried it a couple of times and it is still a wee big watery but I think this could be solved by making sure the vegies are cooked over a high heat. My recipe is a record of what I do but I love Alison Holst’s because it is a list of anything you might put in with no quantities at all. Other ingredients which I might like to add are 1 bunch basil or other herbs, cream, pesto, creamed corn, grated carrot, mushrooms, spring onions, chilli, toasted pine nuts or seeds, tahini, lemon juice, yoghurt or cream cheese, parmesan or other cheeses etc etc. I will continue to experiment so I may post further about this dish, but meanwhile it is a good standby to use some fresh vegies in a lazy pasta dish. It is not a dish to impress guests but is just right for evenings when energy levels are low and time is scarce. Cook pasta in salted water til tender and drain. Set aside in colander. While pasta is cooking chop shallot, garlic, tomatoes and pepper. 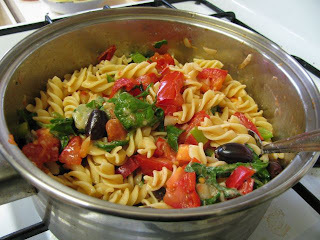 When pasta is drained, heat a slurp of olive oil in the hot saucepan in which pasta was cooked. Add remaining ingredients and fry over high heat 3-5 minutes until tomatoes soften. Add pasta and toss to coat with sauce. 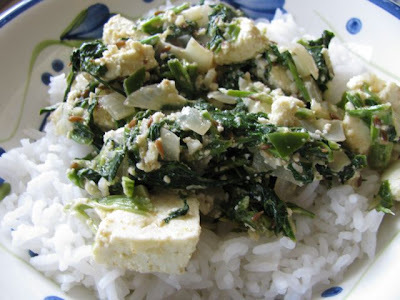 Serve with mung bean sprouts or additional grated cheese. In the small town where I grew up, we lived in the same street as the fire station. I still remember the feeling of fear upon hearing the wail of the fire siren as it summoned the volunteer (CFA) firemen. Sometimes my mum would send my sister up the street to see where the fire was – it was always chalked on a blackboard for those who arrived late. Some times it was just a grass fire but a large fire affected everyone in a small community. I particularly remember the Ash Wednesday bushfires in 1983 when fires along the Great Ocean Road were in the nearby towns we visited frequently, when our town became an evacuation centre, when people who caught the same school bus as me had their houses destroyed by the blaze, and when a family friend suffered smoke inhalation after being caught in the fires while he served as a volunteer fireman. We often visited Melbourne where most of my parents’ families lived. Every now and again a fire truck would whizz past with the warning of the shrill siren. My mum once said that the majority of fire alarms in the city were false alarms. I could watch the city fire engines without much feeling. Even now that I live in Melbourne, I don’t worry so much about city fires which seem contained compared to the wide-ranging bushfires. We languished at home with the air-conditioner on. 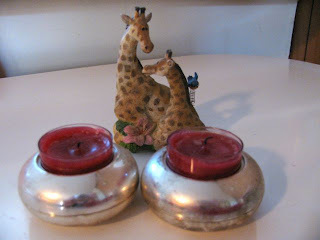 Although unpleasant, compared to people’s losses in the fires, we were among the lucky ones. Bushfires are a terrible reality of country living. Apparently, these ones are have made news around the world. My Scottish mother in law has rung to check we are ok. Bushfires do not come near city-dwelling folk like ourselves. But like Ash Wednesday many years ago, this is a weekend we will remember. Little things. My dad first alerting us to the fires when he visited and told us Melbourne was ringed by fires. Listening to the radio to hear exactly where the fires were. Smoke in the sky and the water bomber helicopter flying over our home. Seeing the names of towns under threat where friends have settled or that we have visited on holiday. Even visiting the zoo when the weather cooled (though I still managed to come home with sunburn and hayfever) and talking to the volunteer guide about endangered native wildlife being relocated to the city zoo from Healesville Sanctuary on the outskirts of Melbourne. And some of us will remember what we ate. During the day, I didn’t have energy to make a salad sandwich and just had peanut butter and sliced tomato instead. E was happy to eat whatever I prepared and was pleasantly surprised by this combination. (It is something I have made every now and again for years but he has only just discovered it.) Plus I ate fruit, frozen fruit kebabs and plenty of iced water. By evening when the cool change arrived I was quite peckish. The previous day I had bought supplies so I didn’t have to leave the house in the heat and had decided on a potato salad, vegie burger and a simple salad. 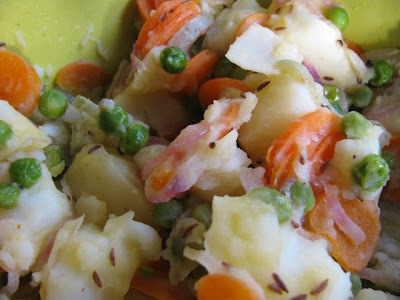 I associate potato salads with hot weather because it is one of the common salads we had with barbecues when it was too hot to cook in my youth. These days, I tend to experiment a bit more with flavours and add other vegetables. Often I don’t use a recipe but just throw in whatever takes my fancy. I also thought this was a good opportunity to make a potato salad for Holler and Lisa’s No Croutons Required event which this month is Potato in a soup or salad. I chose the Dill Pickle Potato Salad from the Enchanted Broccoli Forest. I altered the quantities to suit me. The vinaigrette dressing made it very different to my usual creamy potato salads, but very pleasing. It had a salt and vinegar tang, with a hint of heat, thanks to the black pepper and cayenne. The caraway seeds and dill pickle juice are not flavours I use regularly but imparted a fresh and interesting taste. On Saturday night, we opened the windows and doors when the cool change came at 6 and waited for the house to cool down. When we ate the potato salad it was still hot, mainly because I wasn’t organised enough to give it time to cool. 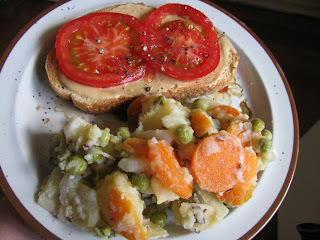 But I had it cold over the next couple of days, accompanied by our snack of the moment - peanut butter and tomato on toast. Melbourne has been a lot cooler this week. The doona is back on the bed and I have hunted out a cardigan. Unfortunately the bushfires continue to burn throughout our state of Victoria. The television news is full of images of rubble where houses used to be. The toll keeps climbing (last count it was 181 dead and over 1000 homes destroyed). None of us can fail to be affected and wish we could do more, but I am heartened by the generosity and resilience that already is evident and will be important in rebuilding lives and communities. Place potato chunks in a medium saucepan with water and bring to the boil. Simmer for 15-20 minutes until soft and tender. (I like my potatoes to be almost mushy.) Drain and rinse in cold water. Meanwhile, heat oil in a frypan and sauté onion, carrot and caraway seeds for about 5 minutes till onion and carrots just soft. Add peas and fry an additional 2-3 minutes till peas cooked. Place remaining ingredients in a medium salad bowl. Add potatoes and onion mixture and toss to combine. Cool before serving or serve warm. The heat has a way of draining energy. Just as the house took a while to cool down after a run of hot days last weekend, so did it take us a few days to get our energy back. I didn’t have a lot of inspiration for cooking and turned to my favourite tofu burgers that I have been making for years. It is relaxing to do something that feels comfortable and requires little concentration. This is a recipe that is different every time I make it but the burgers last weekend were particularly good – light and tasty – so it seems a good time to post a version. 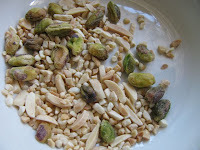 Often I also add ground nuts to the mixture if I have some about but they are not essential. E liked them so much he asked if there were more, but this batch wasn’t a huge one. I managed to effortlessly cook them to gold brown perfection. Ironic, isn’t it? When I made Tofu and Lemongrass Nuggets a few weeks back, I made a real effort to cook them properly in a frypan and they were a mosaic of burnt patches. These burgers were cooked under the grill (broiler) with a bit of oil on them and left while I busied myself with other matters. They came out just right. When they were cooked, I served them with a simple salad and we had them in front of the grand final of the Australian Tennis Open (Rafael Nadal vs Roger Federer). Unfortunately the game went so late that I missed the very ending but it was a nail-biter. I have said before that we don’t watch a lot of sport in our place so this was quite unusual. But enjoyable! 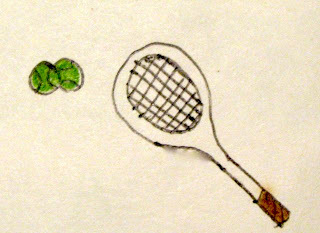 It made me remember how much tennis was part of my childhood. I was never a sporty child. I never liked team sports. When I started high school, I was one of about four girls in our class to never have played netball. I learnt other team sports but never played them regularly. Swimming and bike riding were part of my life but for relaxation or travel rather than in a competitive way (as is still the case today). Tennis was the exception. I played competition tennis for many years and was a terrible player. But I didn’t mind hitting a ball around. One of my fondest memories of tennis was when the family took our racquets and balls up to the nearby Church of England tennis courts. These courts were suffering neglect that meant grass was growing out of the cracks. We just viewed it as an extra challenge because if the ball landed on a crack, there was no knowing which way it would go. It was always fun to see my mum and dad running around after the ball because it made them seem more youthful. We whacked the ball, missed it sometimes, had to fetch it when it went flying over the fence and had lots of laughs. - Driving to ‘away’ games on Saturdays in summer, which were played at tiny towns that were mere dots on the map. - When one of the boys at tennis practice hit a ball back at the coach hard and fast and hit him in the nose. We all felt the coach’s pain. - Never playing in the rain because it would warp the strings of the tennis racquets (I think this idea might have come from a time when they were made of catgut). - Wearing Dunlop Volley sneakers (trainers, sandshoes) because we had to have white soled shoes on the tennis courts. - Spending hours puzzling over what the logo on Pat Cash’s t-shirt represented. I guess sponsors were more subtle in those days. It is years since I have picked up a racquet and I don’t watch much tennis on the telly any more but every now and again, I don’t mind watching the world’s best and remembering more innocent times when I aspired just to hit the ball over the net. 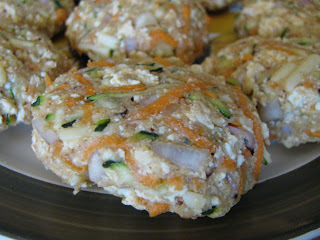 So maybe you will understand why I enjoy these tofu burgers which are low fuss, low energy and taste good. I am not sure you will see them starring on Iron Chef but that is just fine with me. These burgers are perfect for an easy life. Mix all ingredients together in a bowl. Use your hands to take handfuls and shape into about 12 flattish burgers. (Your hands can get a bit mucky but a little water on your hands will help prevent this.) Place burgers under the grill and brush or spray with oil. Grill for about 10 minutes on each side at medium–low heat til golden brown. Serve with salad and chutney. Last Saturday after the scorching heatwave, my dad, my brother, E and I had arranged to have lunch at CERES. The plan arose after my brother had been telling us about going there with his wife and daughter to make themselves bikes for a pittance. Unfortunately my brother couldn’t come on Saturday. The rest of us swithered about whether the ‘cool change’ of 37 C would be too hot, but in the end we decided to risk it and had a lovely relaxing brunch. CERES is an acronym for Centre for Education and Research in Environmental Strategies. It is situated by the Merri Creek in East Brunswick which used to feel miles from the city but these days with rising real estate prices seems almost inner city. Although it is not far from the city, it feels like a little oasis of country living in the midst of picket fence suburbia. 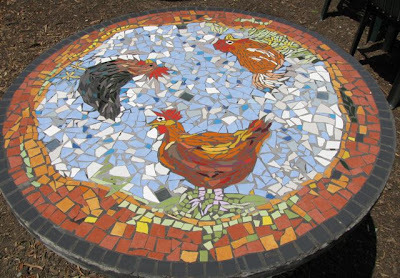 It has a whole range of classes – including bread baking, permaculture, basket making, chook care, cheese making, bike-making etc etc and is a great place to just wander around at leisure. There is a plant nursery, an eco house, odd sculptures (see photo) and a market on Saturday mornings. While, neither the classes nor the café are cheap, they are worth checking out. We were there for the café. It has been a while since E and I have visited, and my dad had never been there. 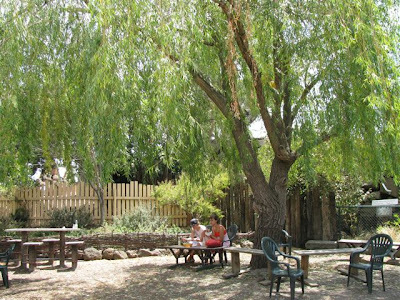 It is a spacious family-friendly area with long tables under a large marquee and verandah (which can be enclosed in cold weather) and smaller round mosaic tables under the leafy trees. I took a photo of the one with chooks especially for my mum. I admire a place that embodies the sustainable practices it espouses. There is no air-conditioning and, in line with CERES environmental goals, there are no bottled water or straws. But we were able to help ourselves to tap water. Most food is organic and all is cooked on site. The toilets are ‘composting’ (ie a seat above a hole in the ground which when I was young we would have called a dunny). Despite it being a warm morning, we found that the shade, an occasional cool breeze, plenty of water and a request for some ice, meant that the heat was not a problem. The café is busy but not crowded, and the atmosphere is relaxed. There were no free mosaic tables in the shade, so we sat under the marquee. The breakfast menu – which is served until 3pm – is extensive with lots of interesting dishes. The lunch menu is smaller but nicely supplemented by the specials menu, including cakes. The café caters for dietary preferences such as vegan and gluten free. I love a menu with a big vegan breakfast, so I don’t need to work out how to order a fry-up with no eggs. It was an easy choice for me. E also went for the big breakfast but he went with the meat and egg version. My dad had an egg and bacon foccacia. My big breakfast ranks among one of the nicest breakfasts I have had out for a while. The plate was full of interesting flavours and textures: marinated smoky tofu, spinach (a little bland by itself but great mixed with rest of meal), dark and intense oven baked mushrooms, sourdough toast brushed with herb infused oil, beetroot and chilli relish, and home made beans which were lightly flavoured and yet tasted so good. We were able to take our time with brunch and chat at leisure. It being my dad’s first visit, he would have liked to have spent some time to get a sense of the whole complex after we had eaten, but the day was too hot for much walking. However, we are hoping we will be back soon to explore more. And we were glad we hadn’t postponed til this weekend when it was 46 C on Saturday! When my mum visited for my birthday afternoon tea, she left a bag of peaches and nectarines for me. I left them for a day or two, with good intentions. Finally I discovered one had grown a nasty black beard so I knew I had to use them or lose them! I bravely decided to make jam. It was a brave move because I am a total novice when it comes to jam. I have managed to do a bit of chutney making this summer, which has helped me feel a little bit more comfortable with sterilising jars but I still feel intimidated by jam. The last time I remember making it is in home economics classes at school. We learnt all the things that could go wrong. Plus I am not a huge fan of sweet things. My jam of preference is St Dalfours from France which is sugar-free and not too sweet. So I will tell you now that it wasn’t the greatest success. I thought the jam I made was too sweet, I cracked a jar by pouring boiling water over cold jars, I burnt my tongue tasting the jam (but not badly), I didn’t do a good job of removing scum from the boiling jam, the jam was a little runny. But I am posting about it because I want to make jam (as good as St Dalfours) and so I need to start by recording my experiences. I hope one day to serve scones with home-made jam and cream like my mum does. I even quite enjoy some jam and cheese on toast. 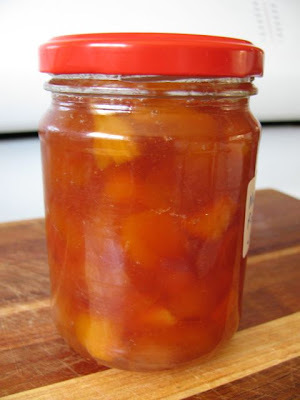 But at the moment we have some of my mum’s home made apricot jam which is quite tart and preferable to the sweet Peach and Pineapple Jam that I made. As a novice, it probably would be helpful to use a proper tried and tested recipe but I had peaches, nectarines and a pineapple and there wasn’t a recipe which matched the quantities I had. I didn’t have much in the way of citrus fruit so I used a lime which was lingering in the fruit bowl. 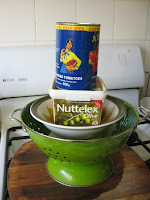 I find that looking up different recipes gives a feel for what I need to do – Nigella, Rose Elliot and some of my older Australian cookbooks gave some insight but required a lot of sugar. I liked Vikki Leng’s recipes which are lower in sugar but she says they don’t last so long and I didn’t have the ingredients. I have written what I did below. It is edible but a bit sweet for my liking. The colour looks right but it could probably be a bit less runny. If I was Nigella I might wax lyrical about golden orbs of pineapple in an amber liquid. But I am not going to kid myself. The recipe needs tweaking but is a start on the jam odyssey. Stone and dice peaches. Trim and dice pineapple. Place in a large saucepan with a little water (just a little on the bottom of the pan) and simmer about 10 minutes til fruit is tender. 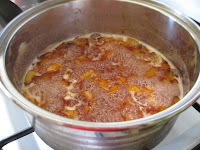 Gradually add sugar while the fruit mixture is still simmering. Add lime or lemon juice. Simmer a further 30 minutes, stirring frequently. Use a metal spoon to skim off scum. Cool a small spoonful on a saucer (Nigella puts her saucers in the freezer so jam cools quicker). Jam is ready when it wrinkles when you push a finger through the cooled spoonful. Mine never got to the wrinkle stage – I did simmer it longer than I intended but I finally thought it was an ok consistency when I cooled a little on a saucer. Remove from heat and set jam aside for 10 minutes. Meanwhile, simmer jam jars in hot water for 5-10 minutes. Using rubber gloves and tongs, drain jars. Fill hot jars with hot jam and immediately screw on lids to seal. What do you think of when you think of kebabs? I think of meat on a stick. I think of Bill Bryson in Notes from a Small Island describing the round column of meat on a spit in kebab shops looking like a man’s thigh. I think of our local Sydney Road where they stuff meat (off the spit) and salad into a pitta bread. I think of a horror movie I saw (and found too scary for me) as a teenager in which a kebab stick was used with murderous intent. Is it any wonder I don’t eat kebabs very often? Of course, it is possible to make vegetarian kebabs with vegies, tofu and/or cheese but, without a barbecue, my opportunities are limited. But I was intrigued by Jeanne ’s theme for January's Waiter There’s Something in My …blog event which this month is Sweet/Savoury Swap. The idea is that we expect particular dishes to be sweet or savoury, so Jeanne encourages us to turn these expectations on their head. Anything, she says, that is ‘departing radically from your lifelong perception of the dish’. On my blog I have made strawberry soup, and am still keen to try making chocolate pizza some day. But I found the theme a challenge, especially in our hot weather, that seemed difficult to meet in a short time frame. Then fate intervened. Jeanne extended the closing date for the event (to yesterday but I am taking advantage of the time difference with the UK) and I happened across a fruit kebab recipe which seemed perfect in this weather. Fruit kebabs are not unknown in culinary circles but as I traditionally think of savoury kebabs and have never made them sweet I thought this would be worth entering. Besides, I wanted to try them. 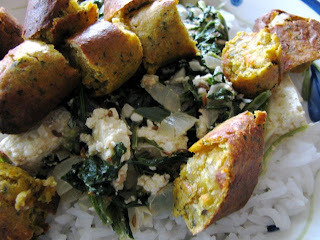 The recipe comes from my Australian Women’s Weekly Vegetarian Cooking. 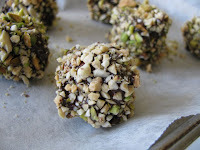 What made it seem interesting is that it has chunks of banana dipped in carob and finely chopped nuts. I am not a carob girl so I used dark chocolate instead. If you are not into nuts for whatever reason, I think coconut might be substituted. The choc-nut banana chunks are threaded on a stick with other fruit chunks. 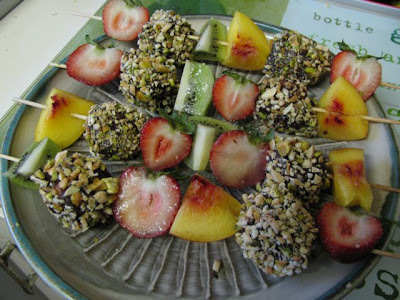 I added a nectarine to the mix of strawberries and kiwi fruit in the book and found I had a bit too much fruit for 4 sticks so I served additional chunks on the side. No cooking or oven is involved (unless you count melting chocolate) and it is so easy you will barely raise a sweat. A perfect dessert if you are entertaining in hot weather. The kebabs could even be served with ice-cream. Or it makes just a refreshing summer snack. The banana chunks are quite rich but the rest of the fruit helps to lighten the dessert. I had a couple of sticks after my dinner last night but E decided to eat ice-cream instead. So I put the remaining two sticks in the freezer over night and had one for my breakfast. 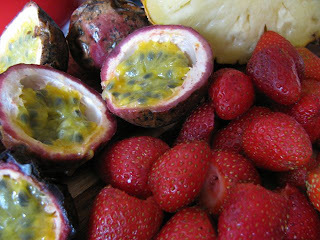 I am not mad keen on chocolate for breakfast but I love fruit in the morning. Today is forecast to be 44 C. Frozen fruit kebabs were a perfect way to start the day – it is already quite warm. So I would recommend them either cold or frozen, depending on heat and preference. I can guarantee you that my last frozen kebab will be gone by the end of the day! Line a small baking tray with baking paper. Melt dark chocolate and oil in a small bowl in the microwave. Place nuts in another bowl. Dip each banana chunk into chocolate, making sure it is covered evenly and transfer to nut bowl (I found it best to use a spoon rather than fingers). Use a fork to cover with nuts and transfer to lined baking tray. Place in fridge to allow chocolate to set – I left mine in for 2-3 hours. When banana is ready, thread banana and fruit chunks onto about 4 wooden skewers in colourful patterns. Serve cold or, if you wish, place in freezer overnight and serve frozen. Planning at this time of year is difficult because Melbourne’s summer weather can be so fickle. With my birthday last week, my family visited a couple of weekends back to share afternoon tea in our backyard. We were lucky because the weather was a mild 24 C.
Birthdays are the perfect excuse to indulge so I made my favourite Walnut Fudge Cake and Grubs. My mum made some scones (including a few gluten free ones with GF flour for my niece) and brought her own home made apricot jam and whipped cream. We also had a fruit platter that I think my sister brought. But I wanted to make something a little lighter than my chocolate treats. 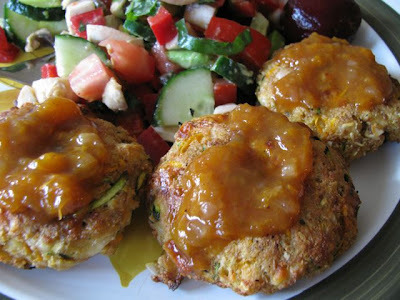 I found a recipe for Apricot and Cheese Balls in Vikki Leng’s A Vegetarian Feast. I made the Apricot and Cheese Balls in the morning before everyone arrived. The recipe said to let the mixture sit for 30 minutes but after this time it was still quite gooey and hard to roll into balls. I think next time it would be better to cool the mixture in the fridge for a few hours so it firms up more. The balls were nice on the day but I think they were better the next day after more time in the fridge. Not that many were eaten at the afternoon tea but I loved having them in the fridge over the next week - they were absolutely delicious and refreshing during the heat wave. They tasted predominately of dried apricot after sitting overnight rather than of the cream cheese. I have a photo* of a beautiful plate that my family gave me for my birthday and wanted to tell you the story of my parents buying it. On our recent trip to Daylesford, we had stopped in an Art Gallery which had a display of Onta Pottery from Japan. I admired a plate and my mum had asked if I would like it for my birthday. It was lovely but I always feel a little concerned about if I have room for extra in our place. I swithered and we left empty-handed. Later I thought maybe I should have asked them to buy it after all because I kept thinking about it. When I opened the present, my mum and dad told me how they organised it. While we were wondering around Daylesford, my mum disappeared and my dad said she must be looking at prices in a real estate agents window. Meanwhile I kept browsing in the giftshops, little knowing that my mum had gone to get the plate and asked my dad to keep me occupied. 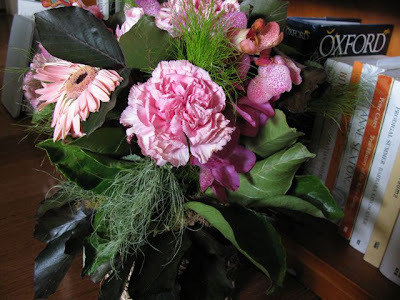 It was such an unexpected and delightful surprise and even better served with some intrigue! Unlike the pleasant weather for the afternoon tea, I was less lucky that my actual birthday fell in the middle of the heatwave. 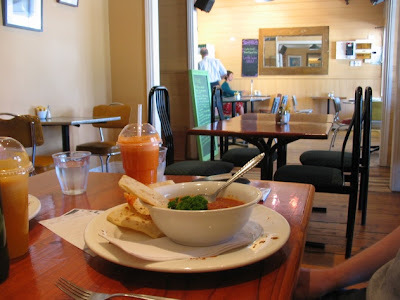 Weeks before, E had been organised and booked us a table at Shakahari, one of my favourite vegetarian restaurants in Melbourne. However the air conditioning struggled with the heat - the staff apologised for it at the end of the meal – but I can’t help but think this is why I didn’t enjoy their food as much as usual (although when we left we realised that it was even hotter outside). I considered a separate post on Shakahari but I decided to wait for another time when it is cool enough for me to have my favourite chocolate pudding for dessert and take more note of the meal. The photo is of an interesting stuffed injera which I had for starter. Between us we also had tempura avocado, madame fang’s croquettes, laksa, and cheesecake. So I was glad I had an early celebration with my family because my actual birthday was just too hot to be hugely enjoyable – but I managed to keep a small piece of my lovely walnut fudge cake aside for the day – and chocolate cake can’t fail to cheer me up! Meanwhile for those fellow Aussies feeling the heat, I highly recommend these Apricot and Cheese Balls as great hot weather snacks. * Finally I have got through my backlog so this post has the first photos from my new camera and I am still puzzling over how to sort and edit photos on my new mac - makes me miss my PC! Mix cream cheese and honey to combine. Mix in apricots. Place mixture in the fridge for at least 30 minutes (preferably a few hours) to firm up a little. Shape into balls and roll in coconut. Keep in fridge. They will last for at least a week. Daylesford was originally a mining town in an area known as Wombat Flat, then as a spa town for tourists to came and ‘take the waters’. I have a small piece of personal history there because my nan went to boarding school there and for a while some of my university friends lived there. Today it is a magnet for treechangers (city folk who leave the rat race to live an alternative lifestyle in the country). It offers a break from the city for those who want a slower pace and affordable housing while still having their lattes and mung beans. 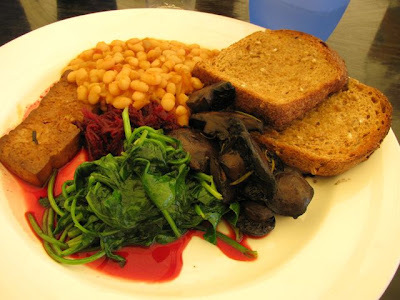 Unlike many country towns, I feel confident we can visit Daylesford and easily find a good vegetarian meal. In fact there is a tyranny of choice when it comes to finding an interesting café but on a recent daytrip to Daylesford with E and my parents, we chose an old favourite, the Harvest Café. The café embodies the spirit of the town. It is a little bit hippy but more upmarket than I remember it. Formerly a little dark and dingy, work has been done since our last visit and it is now brighter and cleaner. Some laminex tables still remain but newer wooden tables have appeared alongside them. It is both café and grocery store. The menu is extensive and predominately vegetarian. We take a printed menu which has a large breakfast menu (including an incredibly expensive big breakfast for $28) but there is also a long list on the specials board (laksa, nachos, pizza) and still more choices in the fridge (falafel, pies). We make our orders and while we wait we browse through the grocery store. 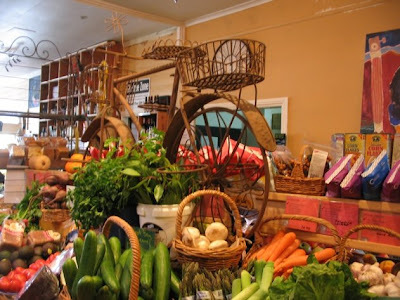 The grocery is quite large with a good range of gluten free and organic goods. Pasta, chutneys, dips, olives, vegie burgers, flours, grains etc pack the shelves. In the middle is a colourful display of organic fruit and vegetables, but like the rest of the store, it is not cheap. I had a tortilla stuffed with tofu and tomato, topped with salsa, cheese and guacamole. The fried chunks of tofu were a little bland but the salsa was pleasantly spicy. It was too filling to finish. 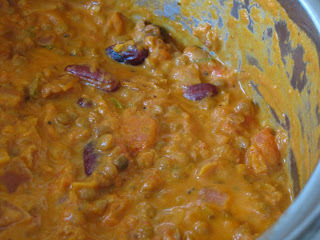 E had dahl which he thought lacking in spice and was more like a tomato and lentil soup. We enjoyed lunch but it could have been much better. 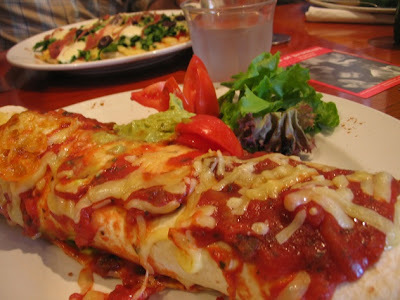 Unfortunately, we both thought the burrito and dahl that we had had at the Vegie Bar recently were far superior. However my mum and dad were very happy with their pizza and bacon & egg roll, both of which looked pleasingly substantial. All of us enjoyed fresh juices except my dad who loves an iced coffee on a hot day. After lunch we had a wonder among the giftshops and galleries of Daylesford. Our favourite bookshop has been renamed. It is now called Paradise Books rather than the Avant Garden, but we still enjoyed browsing there and quite a few purchases were made. 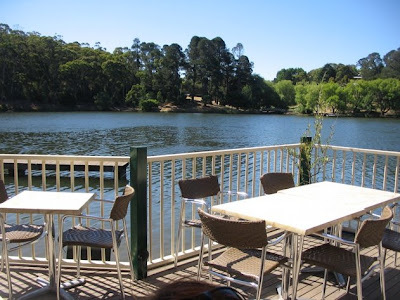 Our final stop was at the Boathouse by the Lake where my mum and dad had scones and tea and I had an icecream and mineral water. Meanwhile E was nearby in the Book Barn. It was a hot day with blue skies so it was lovely sitting on the verandah overlooking the water. Just the way to end a relaxing day in the country! After I made my apricot chutney, I was so happy with it, that it wasn’t enough to have it for breakfast with toast and cheese each morning. I wanted to eat it all the time, any way I could. Firstly I found a recipe for a Potatoes in Mango Chutney Sauce from What’s For Lunch Honey? But when I tried it with apricot chutney, the result was a little bland. It may be that the mango chutney, Meeta used was far more spicy than my chutney. This is one of the reasons it can be frustrating to cook with processed foods. Unless I know the brand/recipe, it is hard to know if my version is the same as someone else’s. However, Meeta's version looks so good that I may try again some time. But then I happened across a recipe that had taken my fancy almost a year ago. Apricot and Orange Glazed Tofu from Veggie Meal Plans. Cassie used apricot jam in hers but I reasoned that I could substitute my chutney, and I scaled down the other ingredients to take the extra chutney flavours into account. 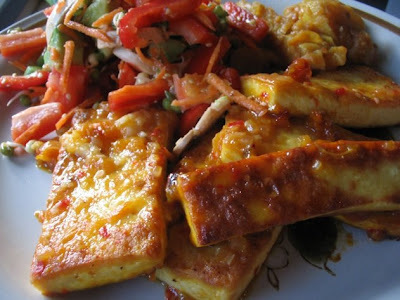 I don’t often make pan fried tofu but this recipe has made me think I should. It was absolutely delicious and quite easy (apart from the scary bubbling up when I poured the glaze in the frypan). It was a spicy fruity sauce that elevated the tofu into a heavenly delicacy. I had firm tofu but decided to press it before I fried it. You can see from the photo that I did it out of the fridge (before our heat wave last week) with a colander, a dessert bowl and some margarine and tinned tomatoes. It wasn't terribly professional but an hour of this pressing helped remove a little extra moisture from the tofu. E was equally impressed. 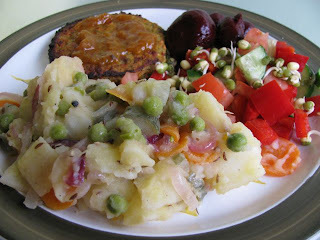 I served it with the last of my potatoes in chutney and a simple salad of vegies and lemon juice. Cassie served hers with rice and cucumber salad. I also noticed when we had finished dinner that she had suggested it served 3-4 but it was eagerly devoured by the two of us because it was so good and not that heavy. I think this is a recipe that tastes great, however you choose to eat it. Combine all ingredients for glaze and set aside. Heat oil in a large non-stick frypan over medium heat. Saute sliced tofu in a single layer until golden brown on both sides: about 10-12 minutes total. Reduce heat to low (I found the liquid bubbled and splattered when it hit the hot pan). Pour glaze over tofu and allow the liquid to thicken which only takes a few minutes and then remove from heat while thick but still liquid. 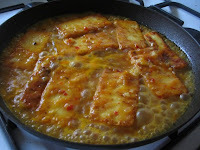 Make sure you flip the tofu so the glaze coats both sides. Update: the East Brunswick Club closed in 2012. 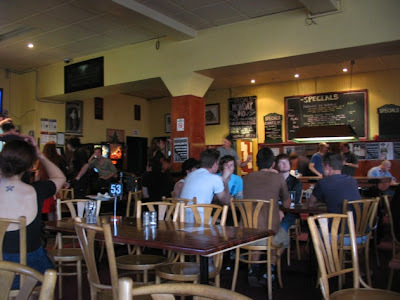 A few Mondays back, E had tickets to see Harmonium play at the East Brunswick Club. I had read good things about it from Cindy and Michael and seen Lisa write up the vegan chicken burger as one of her top five meals of 2008. So we arrived early enough to sample the food. Fortunately I was prepared for a vegan friendly menu that heavily relied on faux meat. 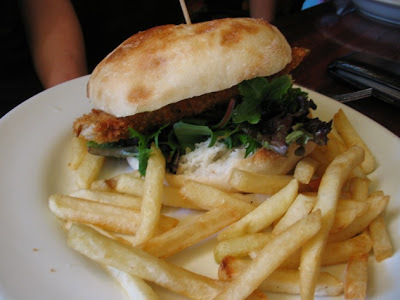 The menu had four dishes: chicken burger, chicken parmigiana, cheese and bacon burger, and pasta. Each was available in a meat or vegan version. Not a menu to enthuse me. I checked and was told that there were no other options. The only faux meat menu I would really fancy might be something with vegetarian sausages. (Now if they had bangers and mash I’d be in like Flynn.) E chose the vegan chicken (or tricken) burger and I reluctantly chose the fettuccine bolognaise because it was the one option without a slab of meat of any persuasion. The food is good honest pub grub as befits the unpretentious nature of the place. While we waited to be served we had time to check it out. The EBC is an old fashioned Aussie hotel that relies on the buzz from the youthful crowd rather than from fancy décor. A few band posters adorn the walls alongside the blackboard menus. Entertainment comes in many guises – a couple of retro pinball machines, a pool table, large screen tvs, and even a couple of DJs in the corner. Most of the tables were full of young people enjoying each others’ company. Many of the students seemed to dress in retro 1980s fashions, but they barely looked old enough to have been born then, which made us feel old! As I wait I notice that the meals are served as they are cooked, with no timing them for groups to eat together. When we arrived, it was busy and we could only find a seat at the other end of a table to a young couple. The guy got his burger first and the two of them politely pick at the chips before he apologetically said he would eat his burger before it gets cold. Later I teased E about what an old married couple we looked when he was served first and started eating straight away, telling me that I eat faster than him anyway! That was fine with me, as I was happy to pick at his chips (which were good but not great). My fettuccine bolognaise came after a bit and was quite dull. I was thankful it had very little in the way of faux mince but would have loved more veg than the thin tomato sauce. (It made me appreciate the pasta at Kalamata a few weeks ago.) I had a small taste of E’s chicken burger but was not that interested in it. He thought it ok and comparable to the Linda McCartney style meals he used to eat in the UK. I thought the best bit was tearing bits off E’s delicious ciabatta bun, which was spread with mayo and avocado, and making little chip butties. Luckily I remembered Cindy swooning over the desserts and she knows her desserts. So instead of struggling through much of the pasta I decided to get my protein from the peanut butter cheesecake. En route to the bar to order, I spied someone being served the chocolate brownies which were drizzled with a deliciously gooey chocolate sauce. I almost changed my mind about dessert but the barmaid persuaded me the cheesecake was worth trying. And it was very good. 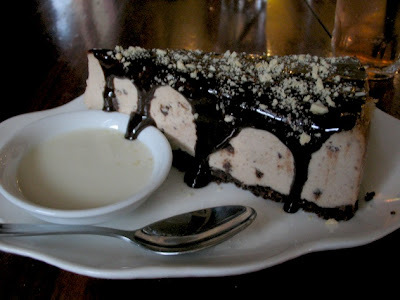 It was baked, with the peanut butter giving additional richness to the thick creamy cheesecake. With a chocolate biscuit base and a chocolate sauce over the top, I got enough of my chocolate fix. According to Cindy, the desserts are all vegan, but I would not have known. By the time we had managed about two thirds of the cheesecake between us, the clientele had changed to a scruffier, older set. Less wide-eyed excitement and more laid back cool. Sure, there were still some youth about, but suddenly I was feeling like a younger part of the crowd. Not surprising given that the ages of the band were 58, 64 and 74. But they had a lot of energy and played amazing music. E described it as spacy, drony, dreamy. Sometimes they were so quiet I could hear beer being poured at the bar, while other parts rocked out! Harmonium could be described as a Krautrock supergroup comprising Roedelius, Moebius and Michael Rother (from Neu). You could be forgiven for not having heard of them and I don’t know if they will be in Australia again. But it seems that the EBC holds some interesting gigs. I hope we will be back at the EBC for their honest down-to-earth pub grub. If I do, I have already decided on my order. It will be the chicken burger which I will eat without the ‘tricken’ and I will definitely have dessert. I will not be expecting restaurant service or gourmet food. But I will look forward to the good vibes.